Last spring when I hosted Anthropologie’s spring fashion show, I met this lovely girl, Veronica. She is the founder of Vintage Meet Modern. When I was in Chicago just a couple of weeks ago, again taking part in Anthro’s show, she came all the way again to see me! She brought me a lovely gift the first time we met (posting it again on Sunday), and brought me ANOTHER beauty this time! How sweet is that??? 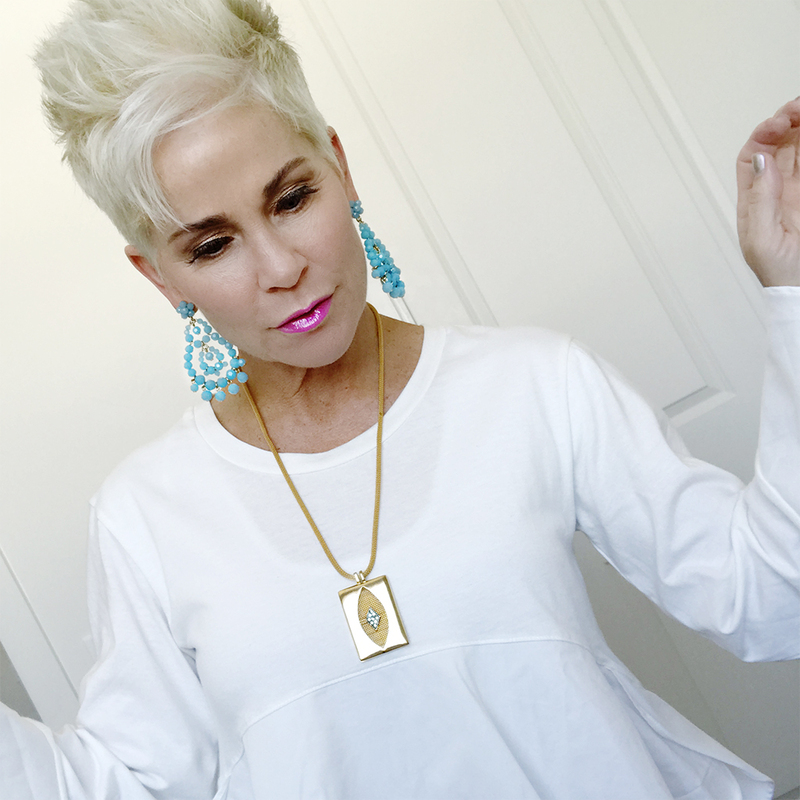 She has the most BEAUTIFUL pieces on her site….you should take a peek! This is what she had all wrapped up for me, along with a note. A Diane Von Furstenberg necklace! Isn’t it GORGEOUS??? After I learned about the piece, I was overwhelmed that she would want to give it to me! This is what she said about it…. I LOVE this quote, and love that I have so many women, like Veronica, all over the world to look up to and admire for what they do and WHO THEY ARE! Thank you sweet friend, for supporting me from the very start of this journey as ChicOver50! You’re gift will always be worn with fond memories of a sweet friend! This picture of me and Veronica was from the Fashion Show a couple of weeks ago. My white peplum top is from Anthropologie and is here. And this floral DVF indulgence of a floral pencil skirt is AMAZING! A similar floral pencil skirt from Nordstrom is here. And the turquoise drop JCrew earrings are here. Gorgeous! And I love Veronica! What a fabulous memento, Shauna!!! It looks spectacular on you!! What a great find!! Gotta check out her site!